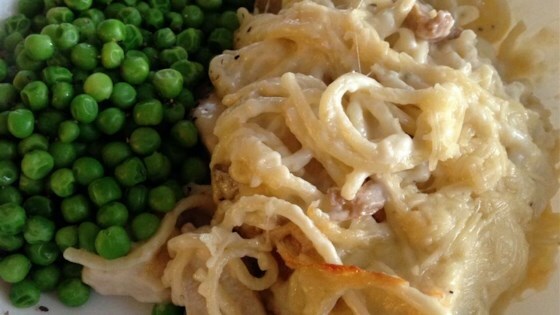 "Chicken, mushrooms and spaghetti baked in a rich, creamy white sauce flavored with Parmesan cheese and sherry." Bring a large pot of lightly salted water to a boil. Add spaghetti, and cook for 8 to 10 minutes, or until al dente; drain. Meanwhile, in a large saucepan, melt butter over low heat. Stir in flour, salt, and pepper. Cook, stirring, until smooth. Remove from heat, and gradually stir in chicken broth and cream. Return to heat, and bring to a low boil for 1 minute, stirring constantly. Add sherry, then stir in cooked spaghetti, mushrooms, and chicken. Pour mixture into the prepared baking dish, and top with Parmesan cheese. Very good. I used skim milk to make a lower fat version. Fresh mushrooms are also a nice touch. This was really good. Tatsed like alfredo, but with a nice mushroom flavor. I used fresh mushrooms and sauted them beforehand instead of canned mushrooms and it turned out nicely.